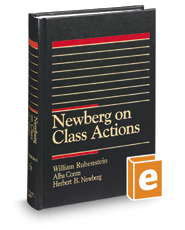 Cited as persuasive authority in more than 600 federal and state court decisions, Newberg on Class Actions provides comprehensive, step-by-step coverage from pretrial through final resolution. The text focuses on the benefits of the class action, particularly in achieving judicial economy and in providing court access to small claimants who would otherwise be without judicial remedy. The set includes The Law of Class Action: Fifty-State Survey by the ABA's Section of Litigation, class action orders and notices, decisions, checklists, and a table of cases.